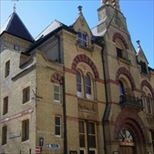 The Corn Exchange is on Wheeler Street, which is located in the centre of Cambridge, directly behind the Guildhall which is in the Market Square. For the nearest parking, follow signs to Grand Arcade car park. The Corn Exchange is accessible by turning either from Hills Road or Trumpington Street into Lensfield Road then into Tennis Court Road, right into Downing Street and left into Corn Exchange Street. This car park is no more than a 5 to 10 minute walk. Directons: Come out of the car park, straight down Trinity Street into Kings Parade, left into Benet Street and on into Wheeler Street. Access Parking: The Cambridge Corn Exchange does not have a carpark, however the nearest carpark is the Grand Arcade carpark next door to the venue. There are 35 blue badge bays available and it is open 24 hours. Further information can be found here. All Stagecoach buses are wheelchair accessible. Information about timetables can be found here. The nearest taxi rank to the venue is on St Andrew's Street, approximately a 3 minute walk from the venue. Taxis will also be able to drop off and collect from outside the venue where there is a lowered curb and ramp access. Assistance dogs are welcome at our venue.